From America's most trusted name in pediatrics, a comprehensive guide to treating and preventing nasal allergies, asthma, food allergies and intolerances, and more. Allergies are one of the most common ailments, causing children to miss school and parents to miss work. Left untreated or unresolved, stuffy noses, itchy skin, and irritated bellies can lead to chronic asthma, eczema, inflammatory bowel disease, and neurological disorders. Today's parents don't just want to treat their family's allergy symptoms ? they want to eliminate allergies and prevent chronic and long-term health complications. The Sears show them how. Drs. Robert and William Sears present a science-based approach that has helped alleviate allergies in many of their patients, providing a plan not only for treatment, but also for prevention. A family-friendly resource, THE ALLERGY BOOK offers all the reassurance and accessible, practical advice that parents need to resolve their children's allergies, now and throughout their lives. 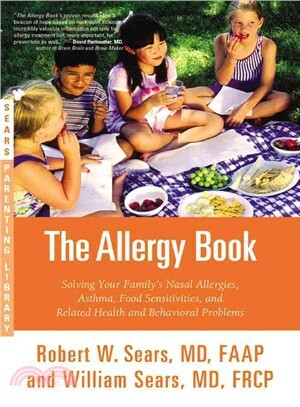 Robert W. Sears, MD, FAAP, a board-certified pediatrician, is the author ofThe Vaccine Book and The Autism Book, and co-author of The Baby Book and The Portable Pediatrician.